It’s already half way through week one of Festival 2018 by the time all our party arrive in Jerez. As is by now traditional, we head out into a rain-soaked town for our first sherry of this year’s Festival. Not too long after we arrive at the Sala Compania and take our seats near the front of the rather lovely converted 13th century church (with – note to late night performance goers to this venue – very comfortable seats). Ours is an early evening slot, so there’s no chance of our dozing in those seats while we await our first performance. We are here to see Jerezano guitarist Javier Patino ( see Jazz Guitar in 2016 ) and Granadan singer Gema Caballero. 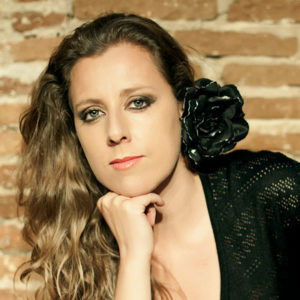 Though both are familiar to me ( I saw Gema Caballero with Sara Calero in 2013 ) I have not seen them performing together before. The Sala Compania is reasonably full when we arrive and is completely full before the performance starts, something which, we begin to realise as days pass, is typical of this edition of the Festival. Most performances are already sold out. The audience is mixed. Some Spanish, though not all are locals and there are many visitors from abroad. While sitting waiting I hear German, French, what seems like Dutch, American and UK English and at least one oriental language. Then the curtain rises to reveal microphones, a cello, a percussion kit and, surprisingly, a sofa. The audience applauds as the performers enter the stage. Patino takes a seat on the sofa and strikes the first chord. The performance begins. Caballero has a wonderfully soft, smoky and fluid voice when she sings more quietly, redolent of Arab ululation. Here she sang traditional songs, sometimes softly, sometimes with great power, but always with tremendous control. Accompanying her, Patino displayed his customary artistry, his rapid moving fingers playing both melody and underscoring bass line. 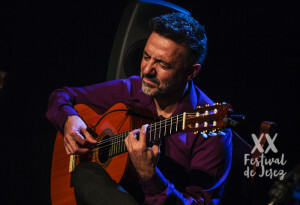 There is a jazzy undertow to some of his solo playing, although he reverts to the traditional flamenco form when acting as accompanist. Patino often has a cellist collaborator and this time the instrument was played, excellently, by Javier Morillas. I had not been convinced, back in 2016 when I last saw Patino, of the appropriateness of a cello but it didn’t strike me as out of place on Friday and it fitted very well indeed with Caballero’s singing. The percussionist was also excellent, one Raul Domingez, whom I have seen before and who, on this occasion, included a terracotta pot in his mix of items with which to make sounds. Patino sat on the sofa throughout, because of an undisclosed infirmity, though it did not affect his skillfulness and, as Caballero said ‘A sofa’s not so bad.’ It meant however, that he was not able to stand and take the audience’s applause, which was loud and copious, for individual songs as well as at the close. We were most appreciative. 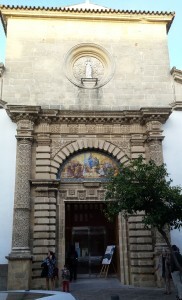 Happy at the end, we spilled out of the church into the newly dark Jerez night, our appetite whetted for more. And appetites whetted in another way too. It was off to a tabanco and then for paella. Festival de Jerez 2018 was underway for us and what a beginning. 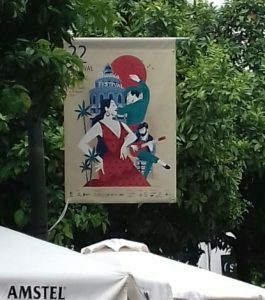 This entry was posted in Culture Vulture, Festival de Jerez, From a Foreign Field and tagged Festival de Jerez, Foreign field by juliej. Bookmark the permalink.